I had never eaten a rutabaga so I decided to buy one and create something with it. For the purpose of trying it this recipe wasn’t the best choice because I am still not sure what a rutabaga taste like. On the other hand the casserole was delicious so I had to share. Feel free to add the roots of your choice. fifteen minutes. While fennel is cooking mix ingredients from nutritional yeast to better than bouillon in a 2 cup measuring cup. Add hot water to equal 2 cups. Once fennel has cooked fifteen minutes had 1/3 cup butter. When butter has melted stir in flour and cook for five more minutes. Slowly stir in nutritional yeast mixture. Let cook for five more minutes. 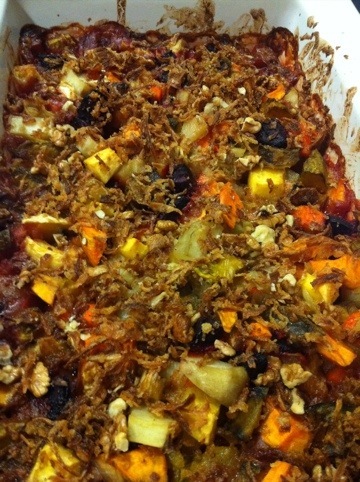 Mix all vegetables in a casserole dish. Mix in fennel sauce. Sprinkle walnuts and dried onion pieces over the top. Bake uncovered for 90 minutes. So it was good with the rutabaga? I want to make this since it will be a good mix of familiar and unfamiliar foods. I’m really pushing myself to try new ingredients and find more favorites. I really couldn’t figure out what the rutabaga tasted like. When I tasted it raw it was slightly bitter but the bitterness did not exist when it was cooked.